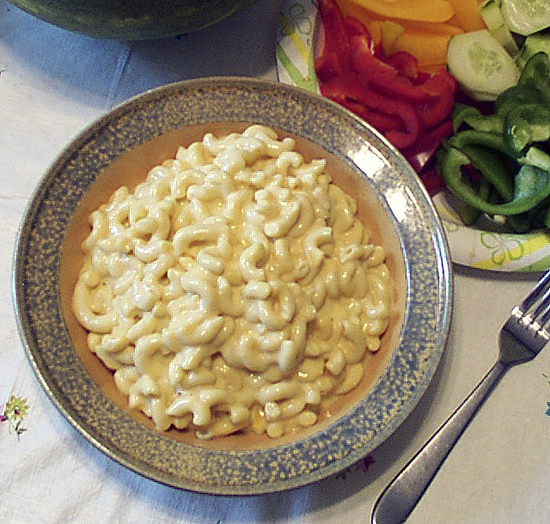 I’ve often mentioned how my June 1, 2007, posting of Mom’s Velveeta Macaroni and Cheese is by far the most popular post on this blog. It’s always at the top of the search stats and has 24 comments, the most-recent comment being posted on May 27, 2010. Recently one of my kids told me they were once looking at that particular post when my ex-wife realized what they were looking at. I was told she promptly printed a copy. That’s how well-liked this dish is. At the same time, however, it dawned on me I should probably have created a printable version of this recipe prior to now, probably a couple years ago. I thought I had, but obviously not. As an aside, mom would have been 80 on March 30th, 2010 but passed away on April 21st, 2009. I’m kinda upset with myself for not having this completed this March 30th in her honor. So, now you can now download a a trifold version of “Grandma Joyce’s Velveeta Macaroni and Cheese”. This is a 3.13M PDF file so it’ll take some time to download. (At only two pages, it’s fairly large because I wanted the images to turn out nicely.) You may also need to download and install the free Adobe Reader to be able to read and print this version. Specific printing instructions for making a “trifold pamphlet” out of it are on the PDF itself. Many thanks to all who have made this recipe so popular. One HAS to respect a man who admits that he has put that EVIL, POISONIOUS, TERRIBLE concoction called ‘Velveeta’ into his body! Now, where the hell did I put my Bison Burger with Velveeta and my cold beer? I am SO forgetful. Thank you for sharing your recipe. I was wondering what to make for dinner. I love your blog! We move here a year ago and from you we’ve become a regulars at Chateau Loise, Kilgus, and Frog leg Inn. Thanks @marilou, glad to have helped! Please let me know if you have any other issues, and thank you for telling me about this one!